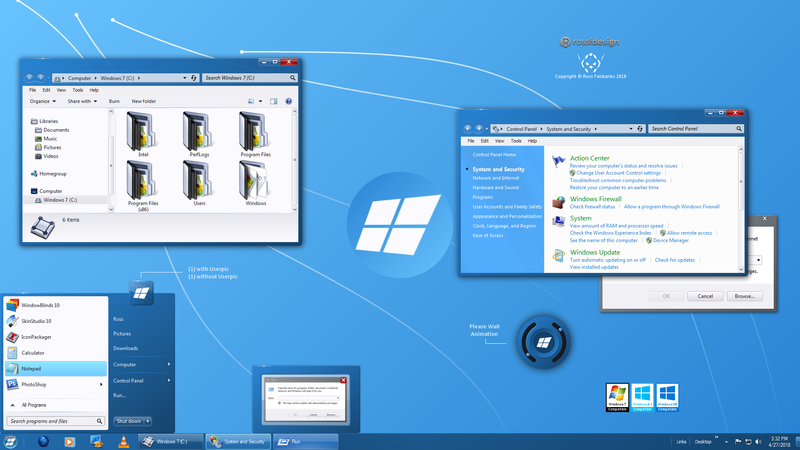 This is my version of what I would want "Windows" to look like. Wallpaper and Userpick are in the folder. Enjoy! Nice work, Ross. Clean and crisp! Very elegant design. Clean, easy to use and very nice, indeed. Thanks for sharing! Nice and simple Ross, looks great! Damn, this is ALMOST exactly what I was looking for all these years! Great updated "Windows 7" experience with almost no flaws, except one - the shadow from above the window prevents it to be plugged all the way up to the top, which for me is annoying, but for now I guess I could live with that, although the fix or a subtheme would be grand! Hello, I like much this theme. what icons are they? Wonderful work! So very pretty. Love it! What icons are those? The icons are "Non-mainstream 2008" by iconboy. Do a search, on this site, for iconboy and they'll show up. Hi Ross, I really like this skin! One question though, if I select multiple items in an explorer window, only the first has the 'Selected Item' color, the other items have an almost white color, and are a bit difficult to see against a white background (expec. when selecting >10 items for example). I tried to change this via Skinstudio, but am not able to find the right item to change. Can you tell me, which skin item color do I have to change to see a diiferent color when selecting multiple items?